While your kids are with us, we want to make a few things happen for them. We think every kid should be known and loved by someone, taught the uncompromised word of God, and be prepared for the next step in their faith journey. Nursery (Birth to 3yr) This is a special place for us to partner with parents to allow your babies and toddlers to experience the love of Jesus in a safe, age-appropriate environment through fun visuals, music, and interactive play. 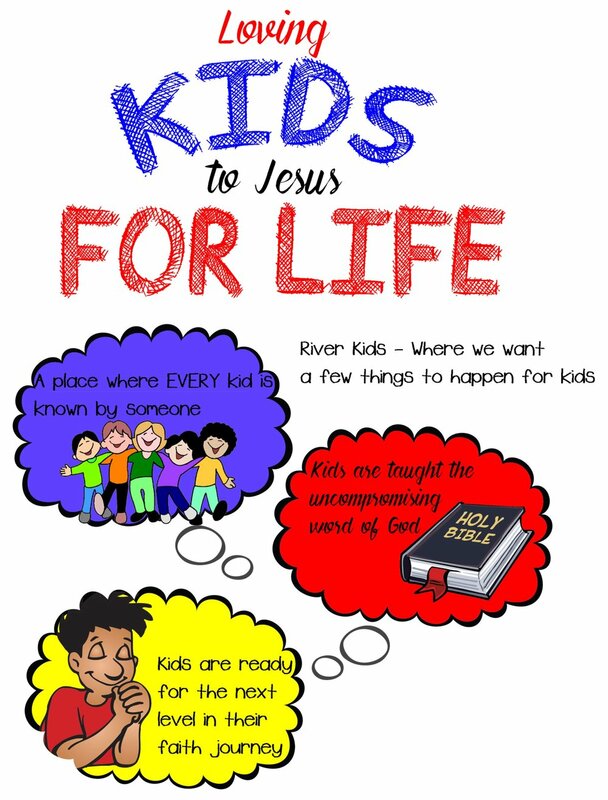 River Kids (PreK – 5th grade) Our desire is to partner with parents to help their child grow and be successful in their Faith Journey with Jesus. While your kids are with us, they will experience an exciting time of inspired praise and worship, followed by a powerful, interactive message tailored specifically to each grade level. Each week is full of excitement, as we experience God together and give kids the tools they need to grow and go deeper in their relationship with a God that is real and loves them deeply. Special Needs If your child has special care needs, we want them to know that Jesus loves them too! We want you to know that we offer a safe place for them to be engaged at their level and learn about God. Because every child matters! A few extras! Join us on the 3rd Sunday’s @ 6pm during Life Group season for Klife! Our very own interactive Kid’s Small Group open to PreK - 5th grade. Join us the last Sunday each month as we join together in unity for Family Service @10am – Where the next generation is the driving force!